The weather continues to be unusually mild. Snow is gone and snowdrops are blooming. I wandered around the property today to check my rhododendrons. 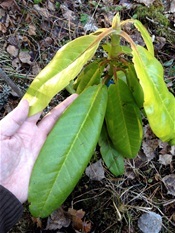 The January cold spell with little snow cover damaged September Flair and Mozari (a xanthocodon hybrid) quite severy but otherwise the winter seems to have been easy on rhododendrons. I'm particularly happy that my own seedlings that I planted outside last summer seem to be in good shape. And one seedling from one of my first crosses ever, September Flair X P.M.A. Tigerstedt, has a flower bud on it! This seedling, however, is the one and only from my cross Queen Anne's X R. brachycarpum var tigerstedtii (called bvt from now on). It is very vigorous and has large leaves. I expect a lot from this youngster.